Ferry travel disruption between Jersey and Guernsey could put this year's Jeremie Cup into jeopardy. All of Saturday's quarter-final matches were called off after ferry problems meant the Jersey sides could not travel to Guernsey to play. "Re-arranging them is going to be quite difficult," Jersey league official John Treleven told BBC Radio Jersey. "We need those matches wrapped up by January as the division splits between the top eight and bottom eight." The Jeremie Cup is one of two inter-island football competitions for sides in Jersey and Guernsey. The Guernsey FA organises the Jeremie Cup and all Guernsey Priaulx League sides take on the top clubs from Jersey, with the Jersey FA organising a similar competition - the Wheway Cup. "Travelling between Jersey and Guernsey is not as straightforward as you would have thought it would be," added Treleven. "When you're negotiating with Guernsey they come out of it better as they can get there and back in a day, whereas it's harder for Jersey going the other way." 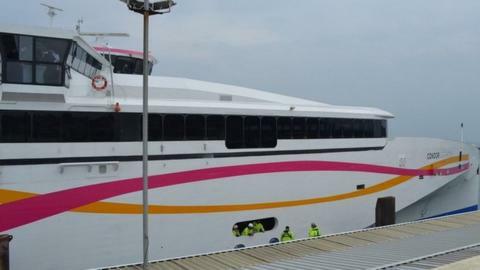 There were angry protests at Poole's ferry terminal on Saturday after 70 passengers were left behind as Condor Ferries fixed problems with their new ship's exhaust system. The firm is the only company offering a ferry route between Jersey and Guernsey. The cost of travel had already seen leading side Jersey Scottish pull out of the Jeremie Cup this season, while Jersey champions St Paul's were not invited to enter after withdrawing last year.